​Scott Gable & C. Dombrowski (edd. 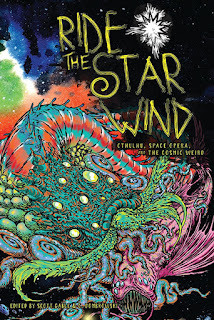 ), Ride the Star Wind: Cthulhu, Space Opera, and the Cosmic Weird. Broken Eye Books, 2017. Pp. ix+445. ISBN 978-1-940372-25-9. $23.99. Gable and Dombrowski have edited several science fiction and horror anthologies for Broken Eye Books, several of them on Lovecraftian or “Cthulhu Mythos” themes. Ride the Star Wind is in this tradition, bringing together twenty-nine short stories that combine elements of Weird, space opera in the truest, far-future, laser-gun, television traditions, and the claustrophobic, existential terror in the face of the true alien: the alien that is like a god that cares no more for us than we care for the wellbeing of potatoes or ethical behavior of nematodes. In fact—and this is no criticism—this blend of cosmic and weird is not so unusual (in either space opera or Cthulhu circles), but it sure is a fun genre, so it’s always good to see more stories and anthologies like this. There is a striking variety of content in Ride the Star Wind, from gutsy horror, gritty war, grueling dystopian, through goofy comedy and nightmarish surrealism, such that most readers will find something to tickle their fancy. While to my taste there were only a couple of excellent and a few very good pieces, a relatively light dusting of brilliance on what is an unusually thick anthology of stories, there are no absolute stinkers or lead balloons in this volume. By far the strongest story is the first we come to: Remy Nakamura’s “The Children of Leng,” which I especially loved because it does something I think all “Lovecraftian” stories should—present a world from the perspective of a non-New England protagonist and an anti-colonial narrative. HPL would have hated it, which should be a qualification for any Weird story written in the last 40 years. Mirai is a child on a generation ship, having just arrived at the distant planet of Leng; her family’s traditional ancestor-reverence acquiring a material dimension by the use of cloning and organic matter recycling in the ship’s habitat. Without spoiling the plot, the story also takes an anti-colonial approach to the existential horror that comes from the encounter between two alien and incompatible species, each of which can apparently only survive through the complete annihilation of the other. Reading this one story was worth the cover price of the whole volume, but I couldn’t help but feel that by opening so strongly, the anthology was doomed to inevitably fall short thereafter. Maybe that sounds unfair: there are other very good stories in here, a few of my favorites being the following. “Starship in the Night Sky” by D.W. Baldwin features Ilyana, a captain who has defeated the universe-devouring King in Yellow, and is fleeing her own corruption in the aftermath; no shortage of horror and world-shattering alien powers, but a note of hope creeping in at the last. In Premee Mohamed’s “Fortunato” a rescue mission to a colony world finds cannibal cultists, mutant oracles, old gods and madness, that (of course) follows them home. “The Writing Wall” by Wendy N. Wagner gives us a biology expedition on a weird fungal planet, ambushed by a cultist librarian—this clash of disciplines is a lovely counterpoint to the deadly conflict between humans and the implacable universe. A much shorter story, Wendy Nikel’s “When the Stars Were Wrong” takes us on the prison ship Andromeda as the crew make a terrible discovery, and might just possibly manage to take a final revenge. Each story in this anthology is illustrated by one of about eight artists in a variety of styles, mostly managing to avoid major spoilers. Its 450 pages are edited and proofed to a high standard, with titles formatted in retro-scifi fonts and cursive drop-caps, enhancing the classic Weird aesthetic that the theme and editorial direction seem to be looking for. The diversity of the content is not purely a nod to variety and mix of genres, but is reflected by diversity and representation among the authors and themes as well, including culture, colonialism, race, gender, sexuality, neuroatypicality, and disability. The relatively small number of stories I have highlighted as excellent aside, Ride the Star Wind is an anthology that does the press and the editors credit, and it is worth looking out for other offerings from Broken Eye Books.